8:39am high tide, we made it to the put in at 9:30 and left by 10am. Although the tide had already turned we were in time to sneak under Chokoloskee bridge and away from the main channel. 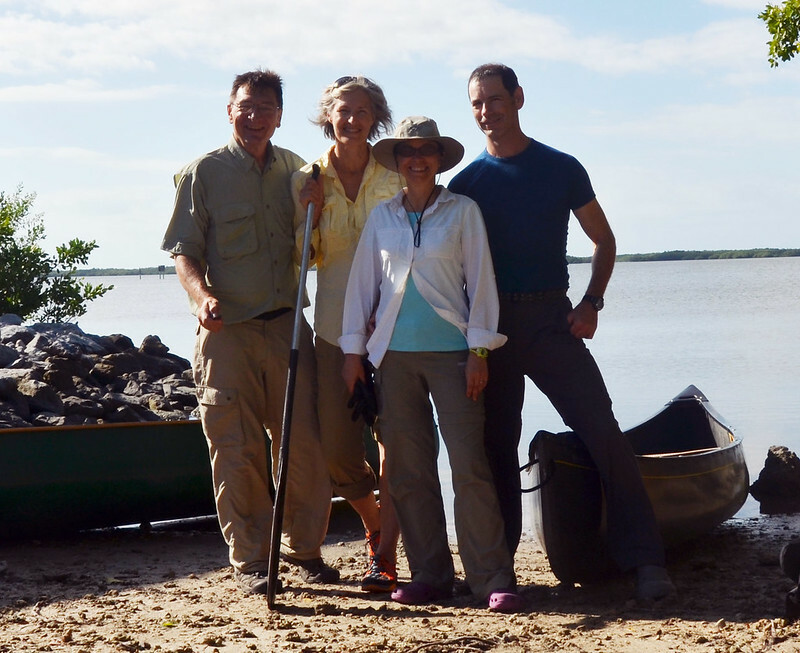 It was very exciting to catch our first glimpse of dolphins, several swam and surfaced around our canoes. We turned left into Turner River and paddled a less traveled route to Crooked Creek Chickee. Very windy but it was welcome in keeping us cool. Much to do at unloading the canoes up to the chickee at low tide when all the gear is at it's heaviest, we have never tripped with so much wine before. The tide came back up with much gurgling and swirling close under our platform, leaping fish all around. Great sunset. It was our introduction to the surprisingly annoying no-see-ums. We left rather late, the heat and humidity already up, under a brilliant blue sky as the tide was coming in. Practically no wind after such a windy day yesterday. 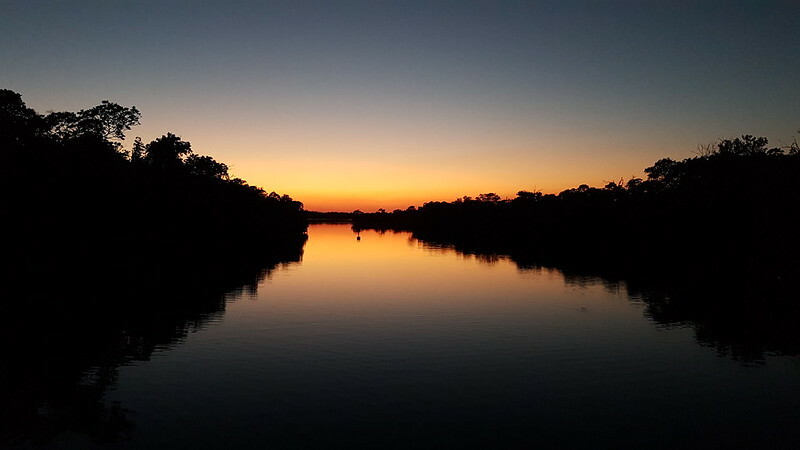 We meandered in and out of various channels and into Crooked Creek, we soon spotted an alligator and then another, Ron and Katherine did a great job of tracking them down for a shot. 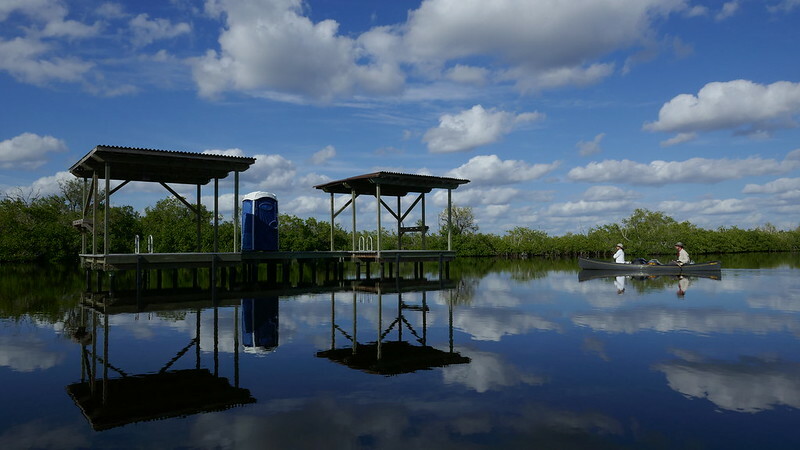 On Huston bay we had lunch near the "last private camp" in the Everglades, the lake was like glass as we made our way towards Sweetwater Chickee, all critters seemed to be sleeping, we had the area to ourselves. After much meandering we arrived at our destination, hot, hot, hot. We were rewarded by the sight of an alligator floating nearby, another hugged the opposite shore on his way out along Sweetwater Creek. There's an alligator circling and playing peek-a-boo around our chickee, a variation on the usual camp chipmunk. Later in the afternoon the fish went crazy, jumping, leaping and splashing non stop for hours. 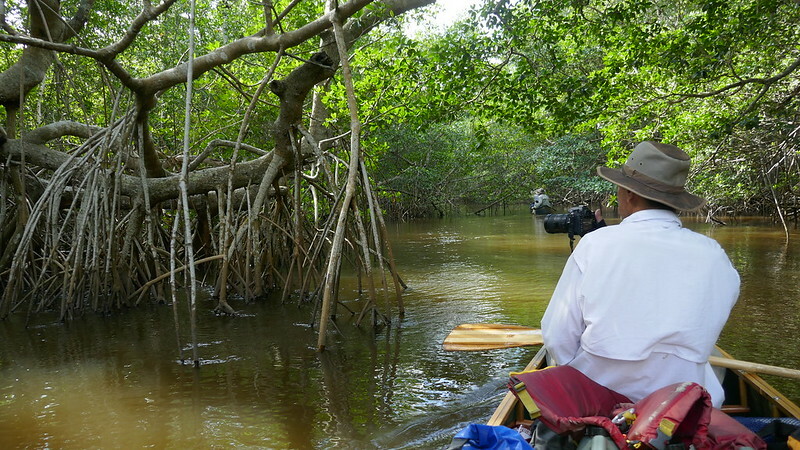 The wild life at this site is definitely worth the extra effort to paddle out of our way. We are happy to be further from the shore than yesterday, no no-see-ums to speak of. Overnight crazy fish action all around the chickee, those alligators had the fish running scared. Ron got up in the middle of the night to observe and called it a "Fish Cauldron". 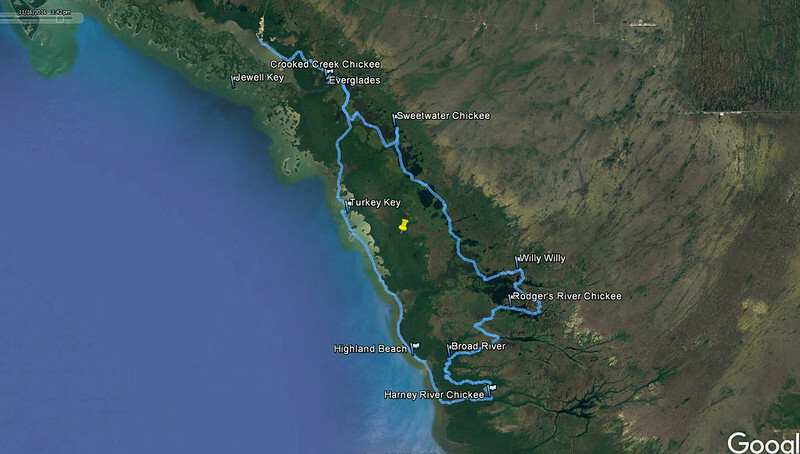 We left relatively early today since we have a long way to go, Plate Creek Chickee was not available and we have opted to go all the way to Willy-Willy. Our alligator friend hung out during breakfast and saw us off. We saw several dolphins playing in the traveling wake of a small power boat on Chevalier Bay, really close to our canoes. Made a pit stop at Darwin ground site and got run off by the mosquitoes. 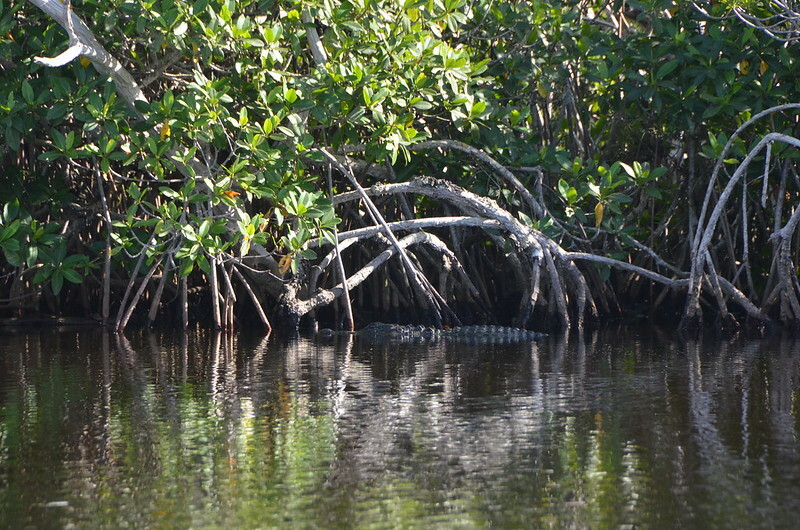 More alligators on Alligator Creek and Alligator Bay, we have lost count of the number of alligator sightings. 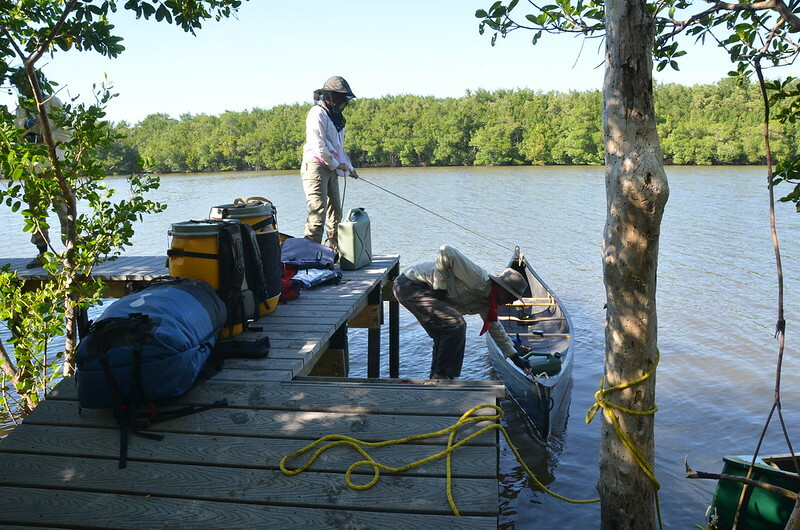 It's another calm and hot day as we navigate from big bays to narrow connecting creeks, sometimes aided by the tide. Plate Creek chickee was being vacated as we passed by, two guys loading up a motor boat. Eventually they caught up with us, two large fellows in a miniature flat bottomed boat, brimming with big bags and eight fishing rods. They commented on how cold it got overnight (they were from Miami), we looked at each other uncomprehending, we had not perceived any "cold". 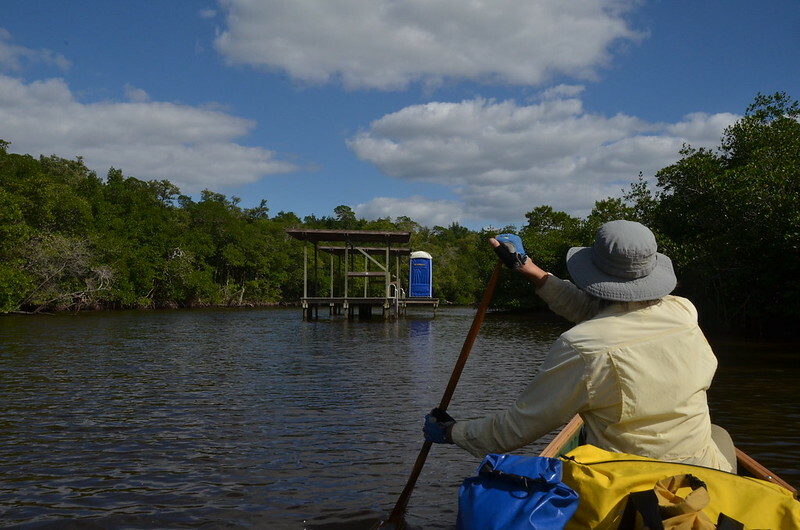 We had a really enjoyable paddle up a meandering narrow channel (labeled alternate route on our map) to Rocky Creek Bay and onto the tiny Willy-Willy boat pier. 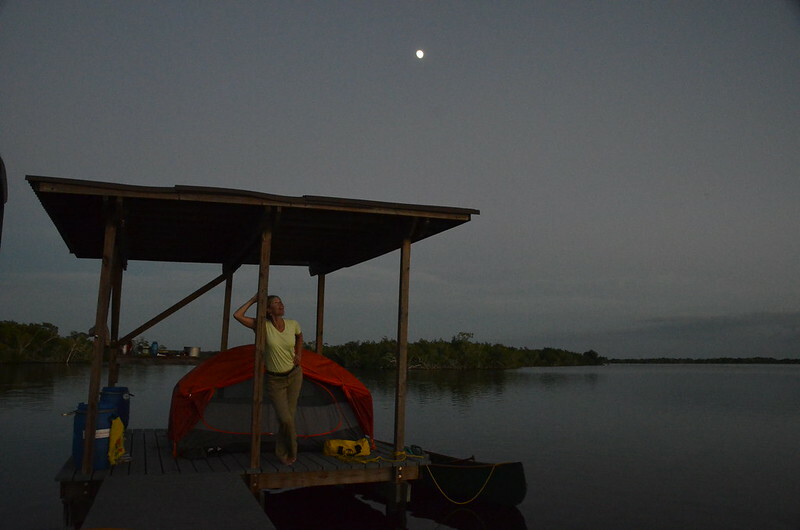 Socks on, full sleeves and head nets before stepping off the canoe, it's a mosquito campsite. There are alligator warning signs posted but we're not worried, the possibility of ground critters and raccoons are our biggest concern. Sections of the ground gets squishy and wet as we walk around, compressed by our weight. Really marvelous camping in such a shady cozy green space surrounded by palm trees. 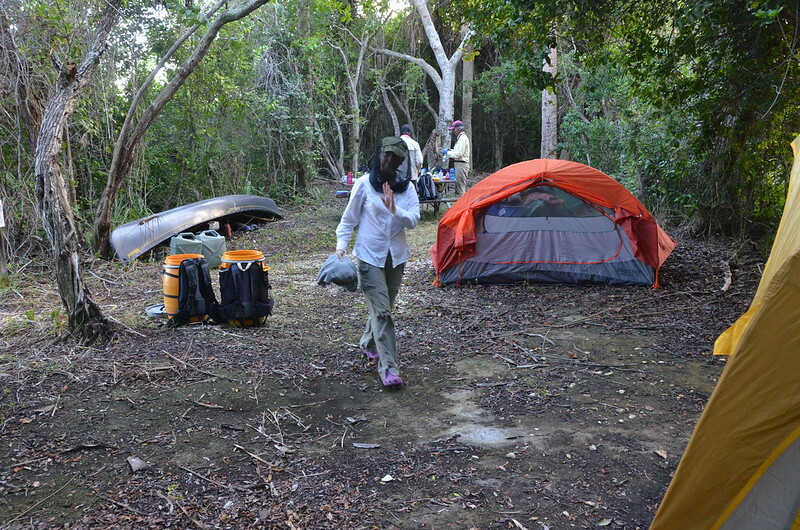 We woke up in our jungle campsite to a cacophony of bird calls. We had a long doddle breakfast inside the Colfax tent, enjoying the shade and protected from the bugs. The resident alligator watched us leave under another hot and cloudless sky. 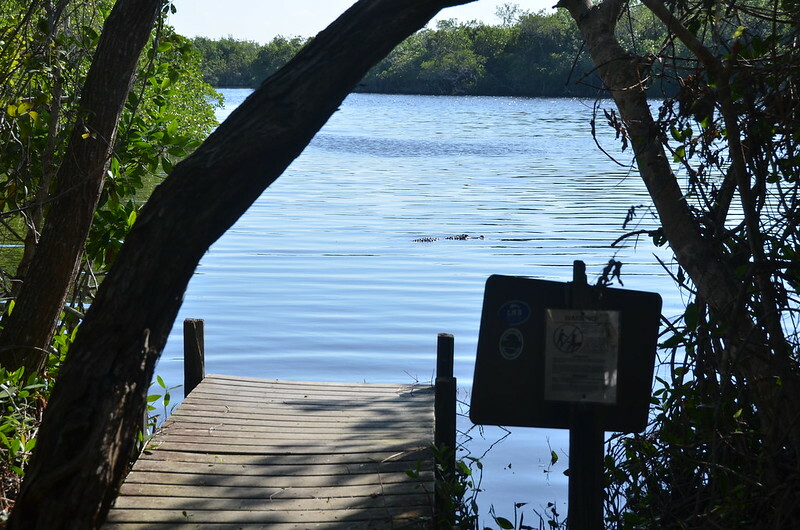 It’s a short day so we took the long way along narrow waterways, we saw a couple more alligators as we meandered and eventually reached our destination chickee on Rogers River Bay. We were visited by a father/son in a fishing boat, here for a few days from the north part of Florida. They commented on the cold front that passed through overnight with a bit of rain, we missed this “cold” front too, I thought it was hot all the time. Another alligator floated by late in the afternoon. Big open view from our chickee, we love chickees. 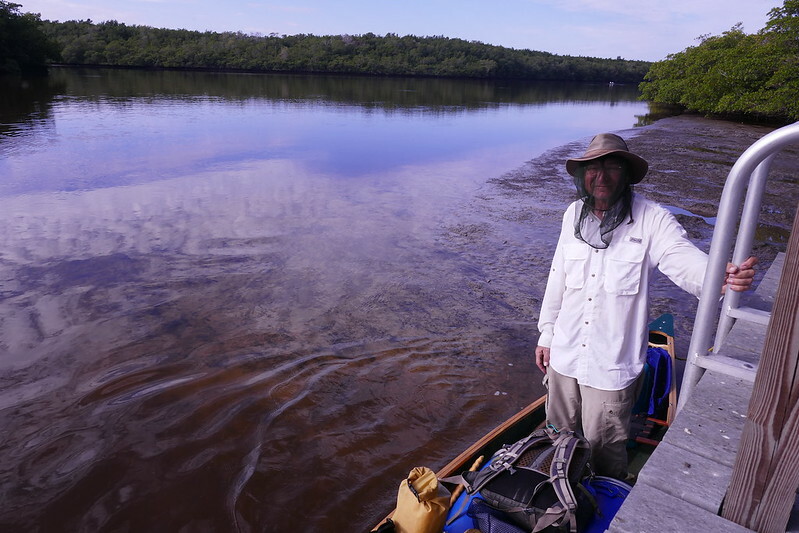 To explore more of the area, we went up the Rogers River, not sure if “up” the river is the correct way to describe it but it was against the current (tide), and then along the narrow “cabbage” cut off to the Broad River. Many birds on the cross over. While on the Rogers River we saw three dolphins, two adults and a juvenile which dived under our canoes leaving blow bubbles all around, and another huge alligator. Very hot while paddling into the incoming tide with a light tailwind, than no noticeable tide but paddling into a head wind (can’t win). Ron and Katherine arrived at our destination ahead of us and scared off two basking alligators. Getting off the river to the site was a real challenge with a steep up and down slippery ramp to a bushy area, it hasn’t been camped on for quite a while. Once we walked around a few times, moved the broken picnic table and cut back the vegetation, we created enough area to set up camp. There are owls in the bush and many flamingos flew by in low formation towards the west. Very nice to sit on the elevated platform over the river in the shade enjoying the breeze, the only no-see-um free place on this campsite (while the breeze lasts). Later, Darryl was covered by a dark layer of no-see-ums while cooking dinner, we offered encouragement while sipping some wine from our bug free zone (inside the Colfax). The no-see-ums at this site are beyond ferocious. We woke up to the continuing no-see-ums onslaught, Darryl braved the thick clouds to get water going for coffee and oatmeal. Ron and Katherine dived into the Colfax and we had a leisurely breakfast in shady comfort. Around 9:30 I stepped out to the pier and noticed the tide coming in in a big hurry. We all jumped to pack up camp and were at the entrance to “The Nightmare” by 10:30. 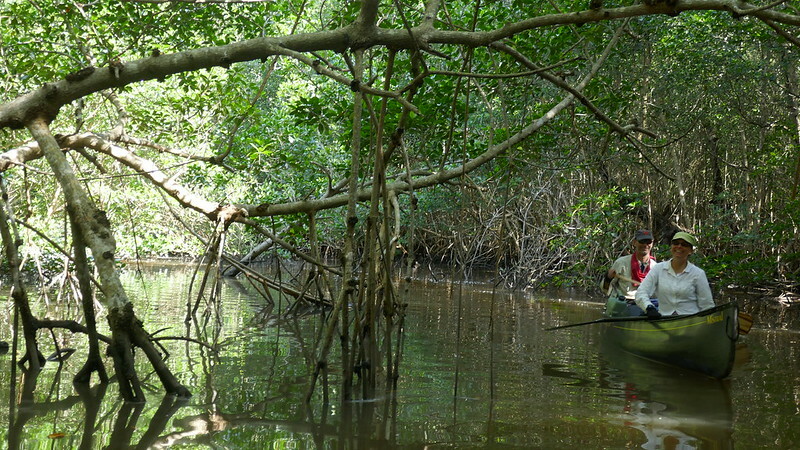 What a marvelous place under the mangrove canopy. We paddled in with the current, then against the current, then with the current again, the current changing at every intersection. 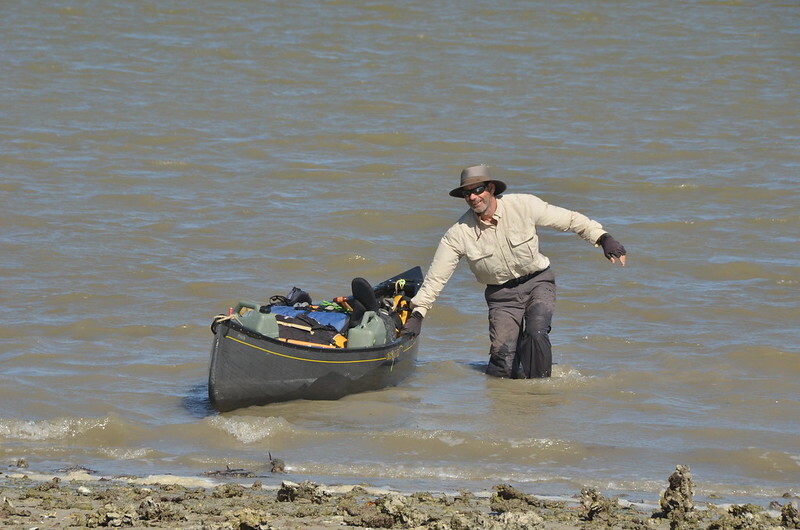 Marker 23 was barely above water, we kept right to stay inland and paddled up Broad Creek, the mangroves closed in again, this time more tightly than the section we’d already paddled. We may be the first people for this season as it was almost impassable, with the high tide we barely fit under leaning trees, always looking way ahead so as to not be trapped by the pushy current. One section Darryl had to saw a downed tree so we could pass. 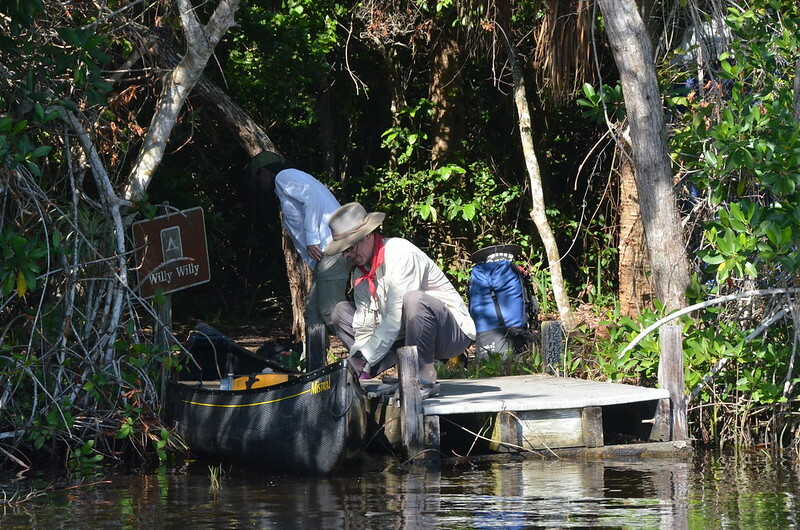 We turned right at marker 14 and floated with the current to Harney River Chickee. The old single platform chickee almost under water, we were able to step off at canoe level to the new platform, as easy as it gets. There are bugs but nothing like last night’s site. 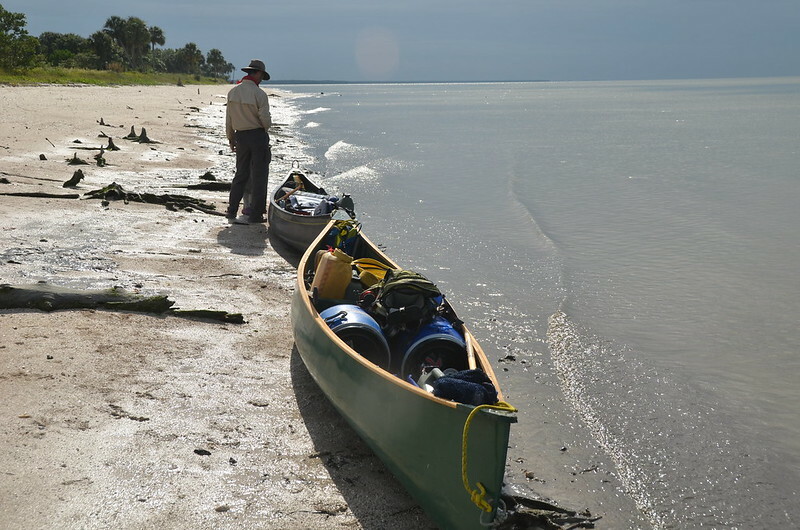 Lot’s of rope is let out on the canoes as the tide recedes and exposes mudflats all the way to the chickees. Huge difference between high and low tide here. Crabs snapping their claws, fish roiling and jumping, lots of sandpipers, all kinds of other birds fly by under a big bright moon. Our guano splattered chickees were visited by birds throughout the night, we woke up to crazy no-see-ums. We left before low tide and made it to the gulf with help from the tide. Variable skies, calm winds and smooth water as far as the eye can see, just beautiful. We met two kayakers going from Highland Beach to Harney Chickee, we missed them by about an hour on previous day going through the first section of “The Nightmare”. On Highland Beach we passed a large Outward Bound group and camped a kilometer further along the beach. 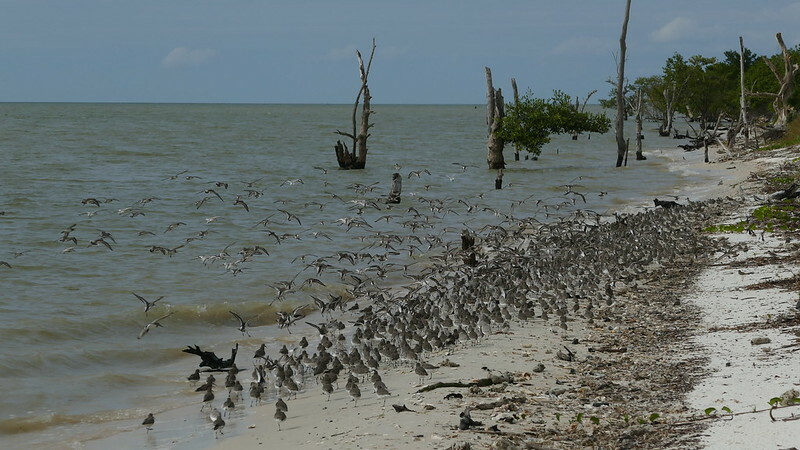 It’s a long narrow beach, great for taking a long walk and bird watching. 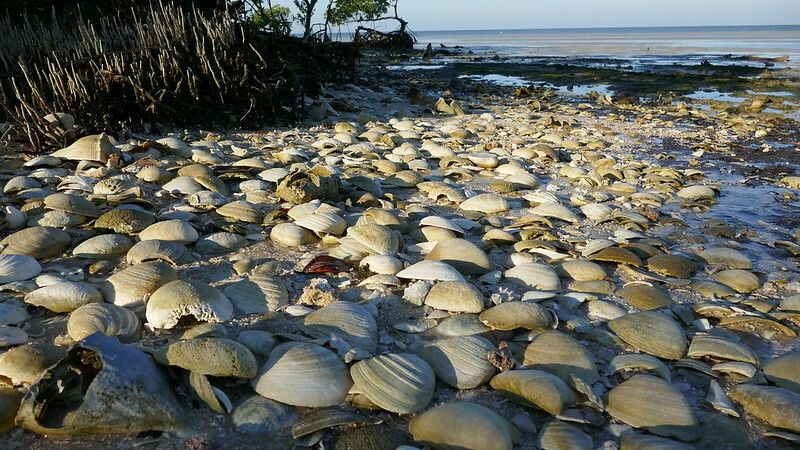 We camped just off the sand, there are burs of all kinds everywhere, which gave us plenty of opportunities to perfect the two shell method of getting them off pants and socks. The incoming tide lulled us to sleep. While waiting for the tide to come in we watched a large fish almost beach a school of tiny fish during a feeding frenzy, we launched as soon as the water hit the firm edge of the beach. 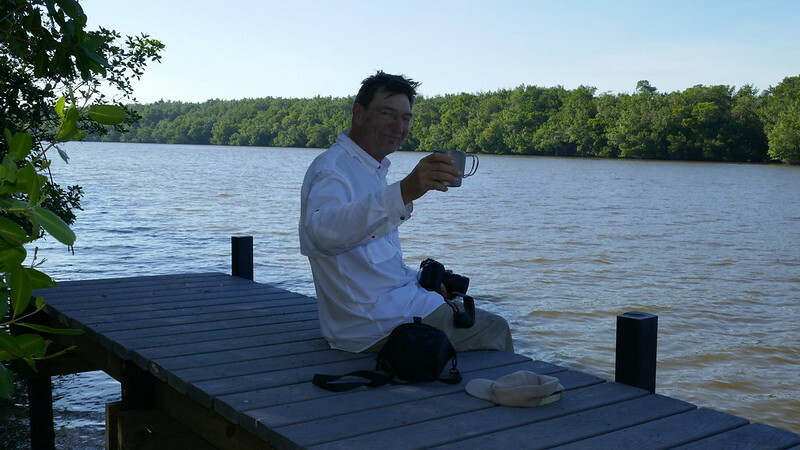 We paddled on and on past the wide mouth of Lastman’s River. Lots of diving pelicans and the water boiling with small fish trying to escape predators from below. 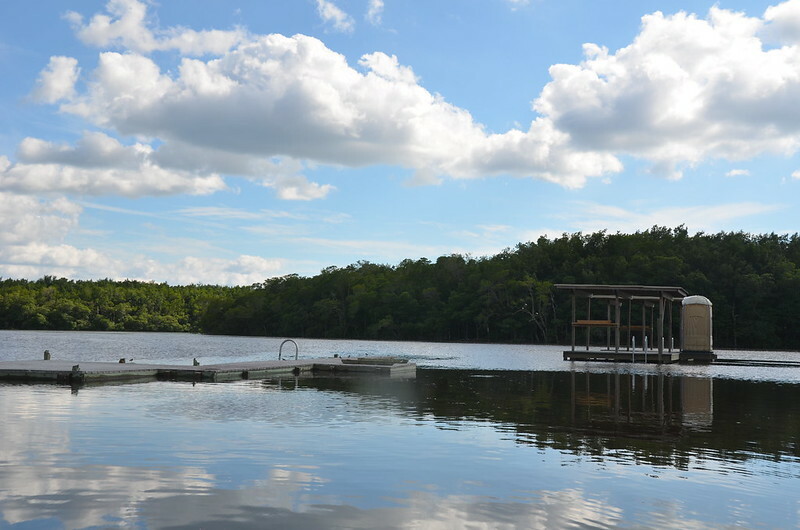 We were checked out by three manatees, they popped up a couple of times. 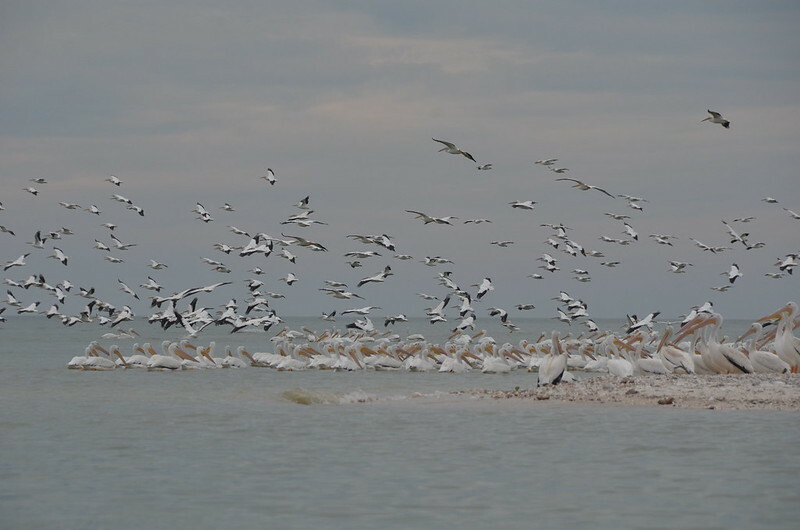 The incredibly white beach in the distance turned into a huge colony of American white pelicans, absolutely amazing when they took flight. 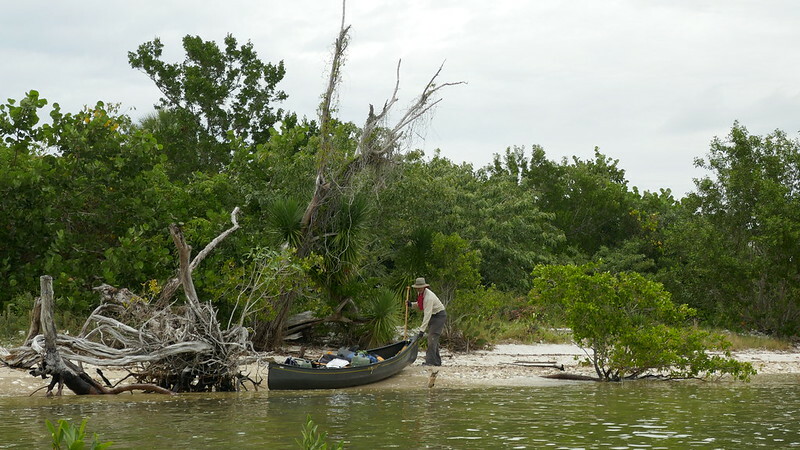 When we got to New Turkey Key, our destination, we did a full paddle around the tiny island trying to figure out the campsite location. 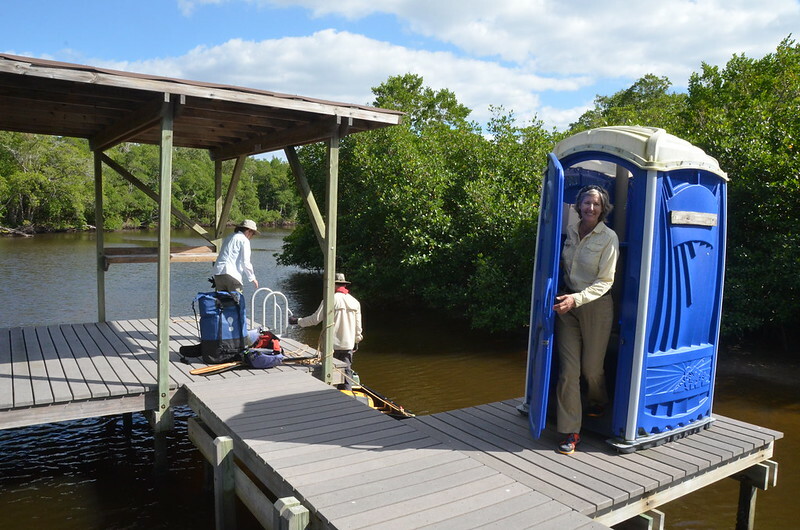 This is definitely not a favourite stop of the Everglades Park, it’s infested with prickly pear and the blue (toilet) box is in a mosquito infested, thorny bushes covered corner of the island. We carefully cleared the site of prickly pear before setting up camp, still Katherine got a puncture in her thermarest. Far away we can see that Turkey Key is occupied by a large group of kayakers, the “old” Turkey Key looks way nicer than the“New” Turkey Key. Overnight, the high tide came up to within a couple of meters of the tents, a strong onshore wind would have pushed waves right over the island. Scary stuff to think about. 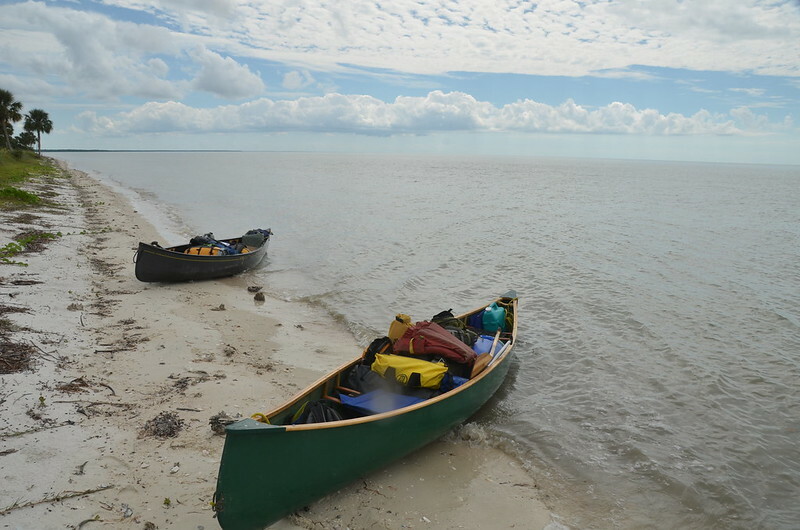 Our neighbours at Turkey Key loaded up their kayaks, walked them out to the low tide and headed out to sea far around us. The wind was up so for shelter we decided to curl away from open water and take the back way. Lots of dolphin action as they pushed fish close to shore for a morning meal. We may have been sheltered but we were also out of water, barely enough to float us. We eventually worked our way to deeper water but the strong onshore wind built up huge waves and we found ourselves wind-bound on Jake Key. After an hour of tough work we can still see the island we left this morning. Jewel Key, our destination for the day was out of the question, the only way for us to deal with the wind was to go inland. We waited about an hour then launched into the crashing waves towards Norman Key for shelter and on towards Huston River, the new goal is for us to make our way back to Crooked Creek Chickee where we had spent our first night. When we got close and had cell reception Ron called the park office and got permission to us to camp there, Lopez River ground site would have been our fall back if Crooked Creek was not available. Big blue sky with lots of head wind, we arrived at Crooked Creek after 6.5 hrs of hard work, all of us tired and canoe cramped. Chickee Madness, the incessant back and forth pacing between tent pads. 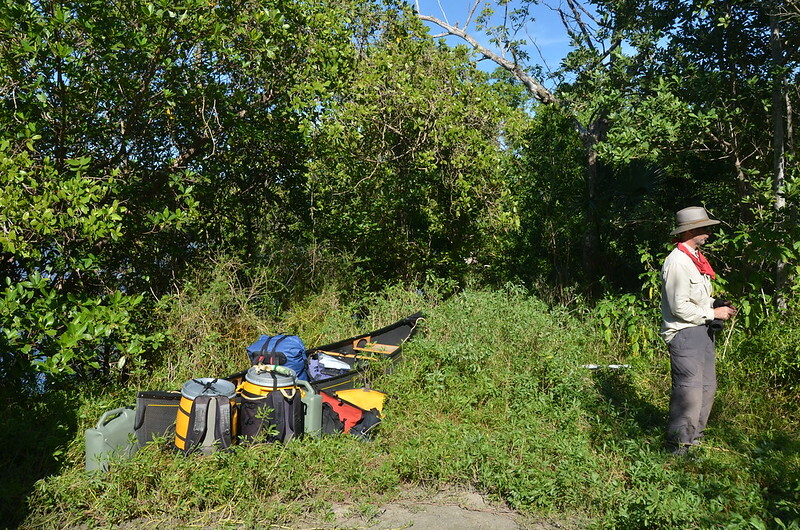 We left and paddled out by way of Lopez River to check out this ground site. It would have been fine but we were happy to have another go at a bit of “Chickee Madness”. The tide was going out but the wind was up and in our faces, we opted to take the inside passage and ride the outgoing tide under the bridge. 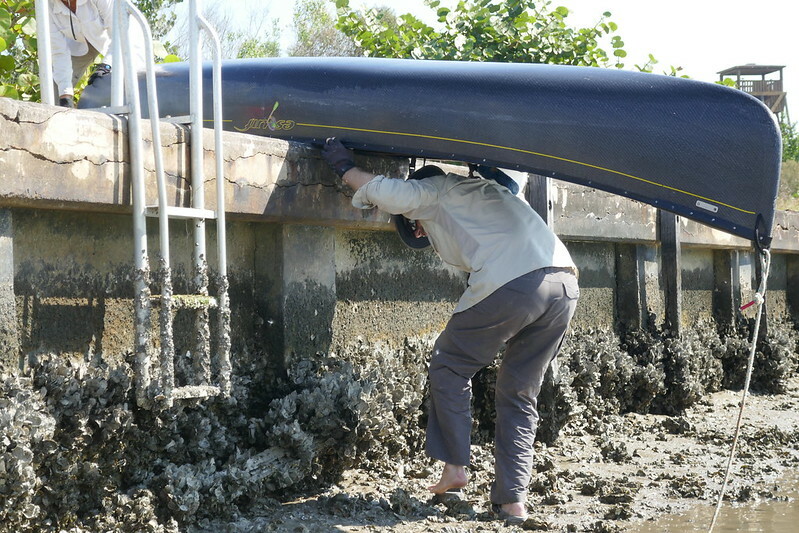 The water kept getting shallower and shallower, we polled our way through the shallow areas and eventually to the boat channel and under the bridge, just in time before the tide turned. This meant that we were far out on the mud for the take out, the mud felt bottomless. We got off the water by using a ladder by the board walk. Darryl tossing the gear up, me catching. Darryl flipped the boat on his shoulders and slid it onto the walkway. Ron and Katherine did the same. We added another layer of mud to ourselves and provided entertainment for the strolling tourists. 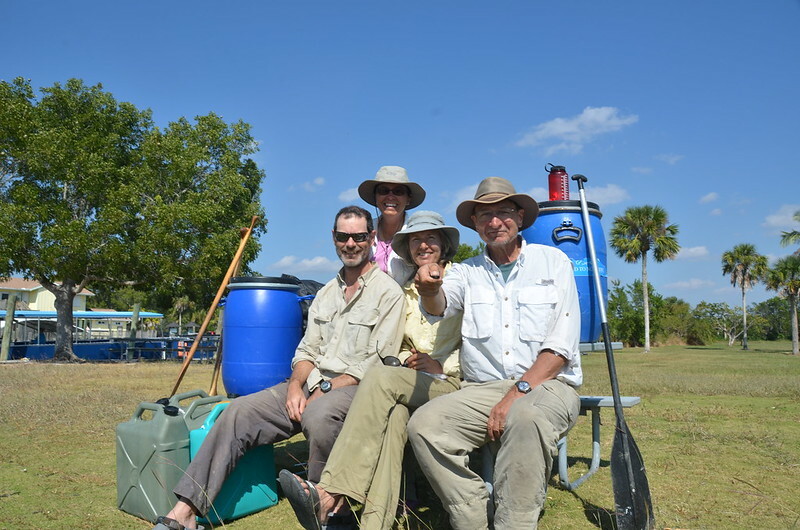 We headed home while Ron and Katherine headed for the Florida Keys to continue with their southern tour. 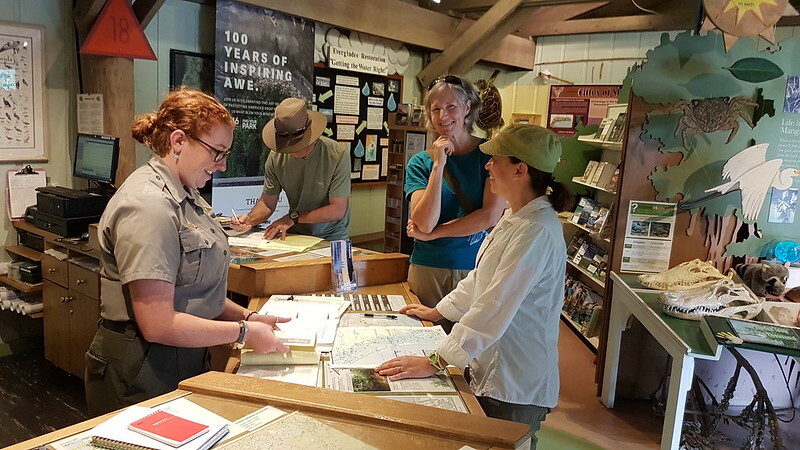 Mid-November through mid-April backcountry permits must be obtained in person at the Gulf Coast Visitor Center or at the Flamingo Visitor Center. 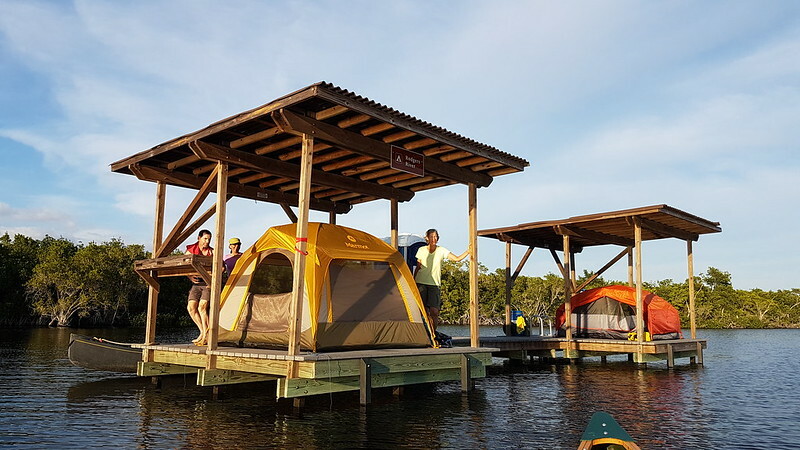 The permit processing fee is $15 as well as a $2 per person per day camping fee. During the summer season (mid-April through mid-November) permits are still required, but there are no fees. Despite all the warnings, the only raccoon we saw was across from the park office. The Marmot Colfax four person tent was a life saver, we also took a tiny free standing battery operated fan which was wonderful for a little breeze inside the tent. 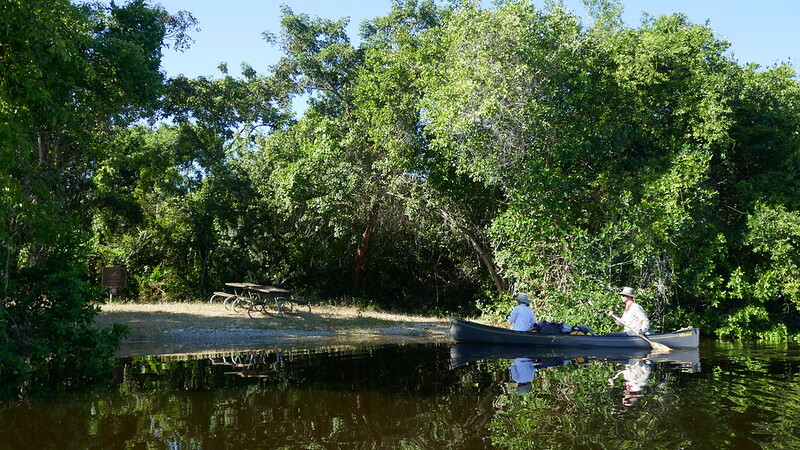 Paddling the Everglades Wilderness Waterway and National Geographic - Everglades Park Map were very helpful during trip planning and to have along for the trip. to think you were only affected by the wind one day! Last time we were at Broad River four years ago the clearing was bigger.. That landing is simply awful and now the campsite needs some clearing! I love Sweetwater and it looks like Willy Willy is the same. The Old Turkey Key is much nicer than the New and (eroding) New Turkey Key.. 7 years ago it wasn't that way. Goes to show you how much things change. Any loons? 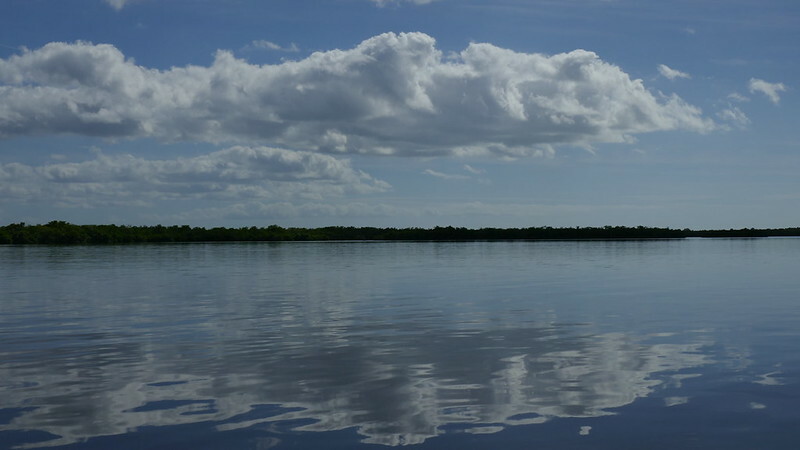 We saw some last Feb in the Everglades. Being the off-season the most of the Chickees were available, and we went in with a plan of booking the double platform sites. Should we have needed the four of us could have slept in the one big tent. Old Turkey Key had eight or so kayakers camping on it and did look like a bigger better sandy site. When we booked it was a coin toss for Turkey vs new Turkey - both were available and we hand no knowledge of the sites. We make jokes about the loons changing their plumage when we see them late in October here in Ontario and they are getting ready for Florida, but we didn't see any in the 'glades'.